Reviews for our new album are starting to pour in, we will post excerpts and links here as they become available. Many thanks to all our reviewers! About midway through Bipolar's set at the Metropolitan Room, trumpeter-flugelhorner-founder Jed Feuer puts his instruments aside—those he can put aside—and applies a more than acceptable vocal instrument to Irving Berlin's "Stepping Out With My Baby." Other than some occasional scatting, which is also appealingly deft, he doesn't sing again, nor do any of the accomplished sidepersons making small big-band sounds along with him venture any trilling. The nonsinging associates are alto saxist Stephanie Long, drummer Barbara Merjan, bassist David Ostrem, and pianist Craig Swanson, who writes the original tunes for the group when Feuer doesn't. Together they make the kind of now-traditional combo jazz that for a couple of reasons puts me in mind of the Eddie Sauter–Bill Finegan Orchestra, active in the 1950s and now practically forgotten. One reason is the bright and bracing music made; another is the jaunts into unexpected musical territory. Feuer—taking himself farther than the Sauter-Finegan predecessors—thinks nothing of retooling, for instance, Ludwig von Beethoven (as he does with "Opus 130") or Johann Sebastian Bach (as he does in the "Kyrie" from the "Mass in B Minor"). You could say the result of such jovial treatment is that they emerge all fugued up. Feuer announces his intentions with his opener, Richard Rodgers' "The Sweetest Sounds." From there, he and his ensemble—each of then getting more than one chance to shine as soloists—make sweet sounds, not just with refurbished classical themes but in various genres. After flavoring the Beethoven with a South American swing, the group gets bluesy on Swanson's "Saratoga Bluesprings," then film-noir underscoringish on Swanson's "Avenue of the Pines," then bossa nova–like on Feuer's "4 A.M." The mood darkens considerably on Feuer's ballad "A Total Loss," which sounded to me as if the melody longs to have words added. Perhaps man of many talents Feuer already has some in mind, something about an ended affair not being a total loss. Leastways that's the message the mournful melody sent me. One of those Feuer talents is his way with a funny comment. His influences in the area aren't mysterious. Telling a funny Richard Rodgers story after "The Sweetest Sounds," he mentioned he knew Rodgers, thereby obliquely referring to his show-biz upbringing as the son of Broadway figure Cy Feuer. The son of any man who produced the first Guys and Dolls, among many other Broadway hits, was brought up among wits and likely to pick up their polished, though often broad, verbal acuity. Feuer's spoken wit is echoed in the title of Bipolar's CD, Euphrates, Me Jane, and also accounts for the wit behind the music. And believe me, wit in a cabaret room these days is nothing to sneeze at. Cleverly but loosely wrapped in the skin of Debussy’s “Beau Soir”, this entertaining arrangement by pianist Craig Swanson takes on a jaunty beat that recasts the mood of the piece from romantic to quixotic. With a sound reminiscent of Claude Bolling’s Suite for Flute and Jazz Piano, especially on the break when Swanson solos, this music is infectious. Its deliberate use of the fine interplay of Long’s flute, Ostrem’s bass and Swanson’s piano creates a wonderfully lilting feel in the center of the piece. They deftly dart around the melody in a carefree but deliberate way that is joyful in its approach. When at last Feuer breaks into a familiar refrain from the melody of Benny Golson’s “Killer Joe,” or in this case "Killer Beau," the sly juxtaposition works nicely to the coda. Well played and originally arranged. This 5-piece ensemble which goes by the moniker, Bipolar, takes classical music to new heights and traditional jazz idioms into lively interpretations. The group’s debut release, Euphrates, Me Jane, taps into a wide breadth of material from reinventing classical pieces such as Bach’s “Prelude,” Beethoven’s “Op. 130,” Debussy’s “Beau Soir,” and Brahms’ “Brahms 3rd,” to embellishing John Lennon and Paul McCartney’s song “And I Love Her” with a breezy post-bop décor, and composing original tunes with stems of traditional jazz motifs reflective of Cole Porter, Toots Thielemans and Joe Henderson. Engineered and mixed by M.P. Kuo, the album blossoms with the elegance of ballroom jazz, and a freedom of movement and expressive ebullient versing in the vane of contemporary-bop. The group infuses Debussy’s “Passepied” with exuberant horns and raveling piano keys clasped to a jolly gait, whereas, “I’m A Fool To Want You,” arranged by the group’s trumpeter/flugelhornist Jed Feuer, has a relaxing ambience with gently wandering horns and slowing rising chord progressions. The group’s rendition of the popular hit song “Just The Two Of Us” has the vibrant feathers of a preening peacock with trumpet trills and a springy saunter in the nimble movements of the piano keys. The shadowy cast that looms over “Brahms 3rd” puts one in a pensive mood with causall y strolling rhythmic beats and a drum solo that bursts out of the seams. Life is filled with joy in Bipolar’s music even when all seems gloomy and destined to fall into despair. The tender slopes etched by Stephanie Long’s flute in “And I Love Her” soar and coast gracefully as the saxophone follows willingly in her path. The group rebounds into a vibrant swing-jazz flare in the title track with wavy horns and scrambling piano keys igniting into a rambunctious tussle. The group’s harmonic forms tug and push in the same direction so there is no friction, just completely unified lines moving with the grain of the melodic patterns. The only contrasts exist in the textures of the instruments, which compliment each other’s tones as the glittering twitters of the horns scrape against the twinkling piano keys, and the bass pumps and drum strikes roll leisurely beneath them. 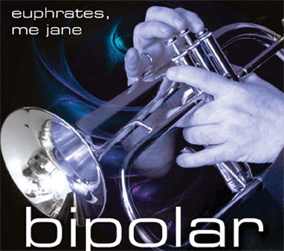 Bipolar is a jazz ensemble which understands their craft inside and out. They shape their harmonic forms into an array of well-honed sonic sculptures that dazzle audiences with a ballroom jazz elegance reflective of Cole Porter, and a freedom of movement that would entice the young and old alike to join in the fun. Their music is Ritz-Carlton class jazz with Lincoln Center outdoor concert fun. In addition to the originals, there's Fauré, more Debussy, Brahms, and Ludwig van (the presto of op. 130, of all things, with a taste of Brazil and Klez!) - all of them kicking jazz tracks. The Bill Withers and Lennon/McCartney tracks are interesting in that they stick more clearly to the melodies, yet are not jazz-lite. Clearly this is not what it means to be medically bipolar. In fact, this disc is good medicine for what ails you. I'd suggest skipping your next purchase of a (name your favorite '60s label) reissue and purchase this one by musicians who are kicking it as we speak. If they're this cool in the studio, I look forward to catching them live. Sample them on their website. http://bipolarjazz.com/ Don't let this disc fall between the cracks. Liners describe this group as "paving new roads in jazz"... in some cases, they used old roads (Bach, Beethoven, even Debussy) to bridge to the new. As per usual, it's the...original compositions that grab my ears and force them to assume the position of attention; most notably (& my favorite cut on the CD) pianist Swanson's "9/13", which swings very solidly; Long's reeds on this tune bounce you right on down the highway, & make for a very pleasant journey. Their rendition of Beethoven's "Op. 130 (Presto)" will (very pleasantly) surprise you, & you'll hear their talent shining right through... doesn't come off (at all) as "jazzers pretending to understand classical" - rather, it brings truly new interpretations to the master's vision! My second favorite track is (of course) another original (also by Craig) titled "Closed (Due to Fire)"... very smooth piano, soothing brush work and full of jazz spirit! Since this is a debut album, I truly expect to hear many more from this group... they are "ON" it, tight all the way through. I give them a HIGHLY RECOMMENDED on this outing! Every once in a while, a disc comes along from a player or band unfamiliar to me, and it turns out to be a wonderful package of delight. Such is the case with Euphrates, Me Jane by Bipolar, a unique quintet comprised of Jed Feuer on trumpet and flugelhorn, Craig Swanson on piano, Stephanie Long on saxophones and flute, David Ostrem on bass and James Windsor-Wells or Robert C. Kelly on drums. They have an eclectic program of 14 selections arranged by Feuer or Swanson. There are creative re-conceivings of several classical pieces by Debussy, Beethoven, Bach, Brahms and Fauré. Feuer and Swanson add a few originals, and they spend some interesting time with “I’m a Fool to Want You,” “And I Love Her” and “Just the Two of Us.” Feuer has a lovely tone on his horns. Long’s versatility lends an important touch to the overall sound of the group. The rhythm section is both supportive and exploratory. Bipolar thinks outside the box, but produces music that is attractive and accessible. This is their debut album, and is one that makes this listener eager for more from them in the future. Of the many highlights on this marvelous first effort are Feuer's opening statement titled after the band, “Bipolar,” a brisk perky piece of music with an almost slight New Orleans flavor. The pianist provides two of the best compositions with the swinging “9/13” where he demonstrates his more-than-able chops on the instrument, opening an avenue for Feuer and Long to solo gently. The other Swanson burner is “Closed (Due To Fire),” a lush arrangement that begins softly and picks up the beat with Long's playful performance giving way to Feuer's muted horn work which all comes together for perhaps the best piece of the album. The classical theme of the recording begins with the Swanson arrangement of Debussy's “Killer Beau (Soir) and continues on the Feuer arrangements of Beethoven's “Op.130,” Bach's “Prelude,” Faure's “Pavane” and ending on “Brahms 3rd.” The lively and jumpy Feuer composed title track serves as the finale. Whether one likes classical music or not, the classical theme does not in any way trump the jazz, for this is clearly a jazz recording that one is bound to enjoy. Kudos to Jed Feuer and the rest of Bipolar because this recording debut, “Euphrates, Me Jane,” is one musical Tarzan of an album that swings mightily. O's Notes: As [Bipolar's] name suggests, they play a multitude of different styles. They open and close with Feuer's upbeat bop tunes, and progress through a series of swinging originals, a couple of pop covers and even some jazzy arrangements of classical pieces. We enjoyed Swanson's swingers: "Closed (Due to Fire)" and "9/13". We also liked their arrangement of “Just The Two Of Us". This is by no means a classical or pop album as these guys really swing! Classics, Beatles, Sinatra, contempopop, you name it -- this Jed Feuer led crew brings it on in fine form. A real jazz crew in the classic Blue Note/Verve sense, the familiar tracks draw you in but the playing keeps you tuned in. With a bunch of fearless new charts layered over everything old, there's a lot of welcome invention taking place that will make you sit up and pay attention. A solid outing that doesn't let you down. And we always enjoy a good play on "Euphrates", it's such a versatile, funny word. Grover Washington Jr.'s most recognizable hit has been covered countless times, but probably never like this. Jed Feuer's swinging arrangement gives this quiet storm icon a nice retrofit. David Ostrem's bass is key. His crisp lines, beginning with a quick statement of the familiar theme right at the top, set a steadfastly jazz tempo. And I when I say "jazz," I mean in the old-fashioned, prewar sense. Feuer's Satchelicious (yes, I just made up that word) trumpet doesn't even acknowledge that Dizzy ever existed. Feuer and soprano saxophonist Stephanie Long engage in call & response, and end up playing different phrases at the same time, veering to within a hair of Dixieland. Some people will claim that Smooth Jazz subverts straight jazz. If true, then payback was overdue. Feuer's “Bipolar” is a lively piece. After trumpet and sax open the song in a duet, the bass solos, aided subtly by the drums and piano, with the horns popping in here and there. Each piece solos, with some of the highlights being Windsor-Wells' cymbals and Swanson's piano. “Killer Beau (Soir)” is Swanson's leisurely arrangement of a Claude Debussy composition. With muted trumpet and flute making appearances, it is a charming take on the classical piece. Then, without warning, the melody quotes Benny Golson's classic jazz piece, “Killer Joe,” while maintaining the jaunty pace. Another Swanson composition, “Closed (Due to Fire),” begins slowly with a piano solo, complemented softly by the bass and a few cymbal strikes by Kelly. The pace quickens as Long enters with a saxophone lead. Feuer joins with muted trumpet fills. The two play off each other exceptionally well. After the piano-led bridge, Feuer delivers a playful solo. As it progresses, the sax comes back in, and the other musicians become a little more active. Kelly injects some rim shots to aid Swanson's solo. Bipolar are purists of jazz of the highest order, or are they? They could be purists of Western classical music, but these are jazz renditions of classical pieces, so why mention anyone being purists? Beats me, but what you will hear is pure musicianship from the people behind Bipolar, and perhaps this is the disorder in question: riding the thin line between jazz and classical and rather than hold to a preference, they handle both on Euphrates, Me Jane. [They] work in unison to create a style of music that sometimes goes back to the glory days of Dave Brubeck, or at least that’s how I hear it. The music is played clear and distinctly without friction, and in a song like “Killer Beau (Soir)” you may not realize that it is a classical piece without reading the liner notes (or this review). Their version of Grover Washington Jr.’s “Just The Two Of Us” has a nice jump that the original lacked, and probably would have done well in this setting if Bill Withers was a jazz vocalist circa 1956 or ‘57, and the piano work from Swanson would have made people move and bow down for its majestic touches. Feuer’s arrangement of The Beatles “And I Love Her” is as beautiful as any other version released since 1964, and hearing it makes it difficult to believe the song is 45 years old. I like this a lot.